When a full spectrum of currencies are available, people will complete more transactions, enabling more people to meet their needs and create trading relationships. Backed currencies such as e-gold can be issued (or barter exchanges completed) by whoever owns a commodity or service. These systems thus do not require a central authority to guarantee the currency and manage its supply. Money created as mutual credit (like LETS, ROCS, and Time Dollars), as well as fiat money that does not bear interest (such as Ithaca HOURS) is in sufficient supply, thus encouraging cooperation among participants. Demurrage currencies also discourage hoarding and encourage longer-term planning and sustainable investment. commodity-backed money or scrip that may be redeemed for a particular product or service. How complementary currency is measured. ROCS, Time Dollars and Ithaca HOURS use the hour of service as unit of account. LETS measures Green Dollars in the corresponding national currency unit. Barter and backed currencies use goods and services themselves to measure exchanges. In most Time Dollars systems, exchange rates are fixed such that each person's hour of service has the same value. For that reason, the Time Dollars model are most prevalent in communities where it is generally accepted that everyone's service time is equivalent in value. 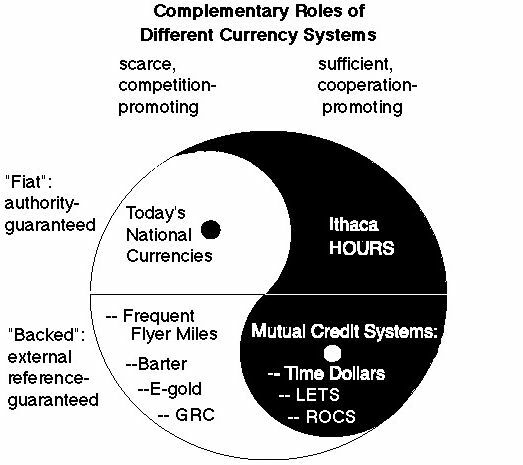 In most other complementary currencies (and in national currency), including mutual credit systems like LETS and ROCS, and in Ithaca HOURS, the amount of money exchanged in any transaction is negotiable. These systems are thus more popular in more diverse communities where products or services requiring a greater variety of skills, experience, training, equipment, or risk are exchanged. I prefer to think of community support through community money as contribution TO the body social/political/economic rather than taxation, which feels more like extraction FROM. Stuff we throw in, comes around; that which is sucked out is most likely gone. encourage trade and cooperation, because the money is in sufficient supply. Those complementary currencies backed by an external reference (a commodity or service) rather than the fiat of a central authority are less susceptible to inflation. Also take a look at a graph showing the increase in complementary currencies since 1980. Pages devoted to specific currency models (LETS, Time Dollars, backed currency, national currency, Ithaca HOURS, and ROCS money); as well as a general description of how money works. a directory of publications relating to complementary currency systems and how the Internet can facilitate them. Bernard Lietaer's The Future of Money: Creating New Wealth, Work, and a Wiser World was published in January 2001 (and is available in German from http://www.futuremoney.de). Gill Seyfang's "Examining Local Currency Systems: A Social Audit Approach"
The Next Reformation: an interview with Paul Hawken by Sarah van Gelder. "Beyond Greed and Scarcity: An Interview with Bernard Lietaer" by Sarah van Gelder, Editor of Yes! appeared in the Money: Print Your Own! issue. "What You Can Do to Build a New Economy"
The Book of Visions invites you to evaluate the need for regional currencies. Libertarians prefer to call them "Free Currencies" or "Competitive Currencies"
Lewis D. Solomon's Local Currencies: a Legal and Policy Analysis was published in the Kansas Journal of Law and Public Policy, 5:2. Local Monetary Reform - Do It Yourself! Ken Stokes proposed a Kauaian currency in his October 20, 1999 column, which also presented images of the 5-Coconut note. The Transaction Net site is an independent, open forum where anyone and everyone can explore new economic media, so if you know of another site that deserves attention, please let us know. You're also invited to register and join us over in The Money Conference. Join us in The Money Conference, where we're gathering to compare insights on all kinds of money systems--old, new, high- and low-tech, real or theoretical--and to synthesize from our shared experience wiser and more efficient models of exchange media. Sign up for Motet conferencing, then come on in and introduce yourself. How could we improve this resource?